Oatmeal is one of our most healthy breakfast options to begin with. It's the only whole grain food recognized by the FDA to lower cholesterol and reduce the risk of heart disease. So taking oatmeal and making it healthier is akin to taking an orange and injecting it with vitamins. We're all pretty familiar with the taste of oranges. But how would a vitamin-infused orange taste? Would the vitamins detract from the orange? Would it add a "vitamin" flavor? Would that "vitamin" flavor be an asset or a liability? For now, we'll stay focused on Oatmeal - chiefly, the Golden Maple flavored oatmeal from Quaker's new Take Heart line. The vitamins they added were vitamins E and vitamin C. They took away some sodium. And they managed to fit in more "soluble fiber from oats". This is all well and good, but like our vitamin-orange... how does it taste? Let's begin with the question... what is "Golden Maple" flavor. I'd describe it as a gentle blend of maple and honey. 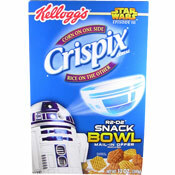 The packaging doesn't tout any honey flavor and it may be unintentional, but there is a definite undertone of honey. Honey is golden, so I guess it makes sense... unless you consider that maple syrup is also golden... it which case, it makes double-sense. I expected this oatmeal to taste like a tampered-with Quaker Maple and Brown Sugar Oatmeal. The second ingredient listed is brown sugar. To this oatmeal's credit - while being very reminiscent of the more familiar flavor - its taste is somewhat unique. No great surprises... no fantastic new flavor... just a slightly different take on maple. The added "health" and reduced sodium wouldn't be noticed if you were served this oatmeal with a blindfold. You'd simply think you were eating a new flavor of oatmeal. This is in stark contrast to Quaker's other new line of oatmeal, "Weight Control," in which they replaced sugar with "non-nutritive" sweeteners. In that line, you can taste that "health" - in as much as "non-nutritive" sweeteners taste like "health". The bottom line is this: Golden Maple Take Heart is pretty average oatmeal. It tastes okay. The original Quaker Maple and Brown Sugar that we grew up with is better. Incidentally, vitamin-infused oranges taste pretty great. 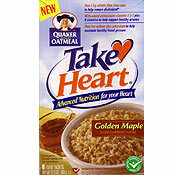 What do you think of Take Heart Golden Maple Oatmeal?